Accommodation on Koh Pha Ngan is available at a wide range of levels, with something to suit virtually every taste. The island has modernised from the days when all the huts were made from bamboo and grass, and the only western food on the menu was banana pancake. Koh Pha Ngan's growing popularity is bringing a wider range of tourists to its shores, with travellers rubbing backs with package tourists from Samui. To cater for this wider range of tastes, the resorts are modernising their rooms, increasing their facilities and offering a greater variety of dishes on their menus; all at cheaper Pha Ngan prices. The resorts have adapted to incorporate A/C, hot water and other things previous visitors dreamed about but couldn't have. Accommodation standards on the island have risen dramatically over the last couple of years and most of the old skool 80 to 100 Baht huts have been replaced with 250 to 500 Baht fan rooms; and A/C rooms can be found at most resorts for 800 Baht and up. Koh Pha Ngan still retains its chilled out vibe and rustic desert island living, and virtually all the accommodation in still in friendly, family run bungalow operations. The locals love the place even more than its guests, thus most of the modernisation has been done tastefully, blending in with the wonderful natural surroundings. One of the great things about this island is the great variety of different places to stay, with beachfront bungalows, chalets in the rainforest, deserted beaches to camp on and luxury hilltop resorts, every taste is catered for. That counts for the vibe your looking for to; you can party yourself to pieces in Had Rin, watch coral grow from your hammock or you can stay at Than Sadet National Park and check out the giant monitor lizards. Due to the great geographical diversity that the island has to offer, each beach has its own individual characteristics and attributes, leading to a different vibe on every beach with each one having its own identity. Thongtapan Resort can be found amidst lush tropical gardens on the quiet northern end of Thong Nai Pan Noi Beach. The resort is well-established and provides travellers with plenty of space, a very welcoming and tranquil atmosphere. Now equipped with Free wifi around reception and beachfront area. Guests are provided with a variety of bungalows from which to choose: beach side bungalows, stylish wooden huts located on the rocks over looking the bay, and even a 2 bedroom villa for a family that can sleep up 2 adults and 2 children. As you would expect, rooms come with private bathroom and the luxury of private balconies orientated to catch the pleasant breezes that blow in from the Gulf of Thailand. Buri Beach Resort is located on Had Rin Nai, the quiet and serene sunset beach on the southern side of Had Rin town; where all the action five minutes walk away at the famous party beach Had Rin Nok, yet far enough from the resort to ensure you get a good nights sleep! This side of Had Rin is well known for its peace and tranquillity. The resort boasts Air-Con accommodation with hot water, minibar, cable TV and computer with internet connection. There is also a fully equipped Health Spa, including herbal steam sauna, jacuzzi, traditional Thai and oil massage therapies to ease away those aches and pains from a long journey or the night before or simply relax by the beachfront swimming pool and soak up the sun! At the 4-star Buri Rasa Village on Thong Nai Pa Noi beach there are over 60 hotel rooms, each one only a few steps to one of the best beaches on Koh Phangan. Coco Hut offers supreme air-con and fan accommodation on the tranquil paradise beach of Haad Leela. The resort has a wide-range of accommodation so suit most budgets; there are cheap guesthouse fan rooms or top-end beachfront air-con bungalows with all the mod-cons including mini-bar, UBC TV and hot water, and also an excellent choice of bungalows on hillside allowing guests to relax and watch the spectacular sunset from their balcony. The resort has over 100 metres of beachfront on one of the most popular beaches on the island. Haad Leela beach has long been a place of tranquility and only a stone's throw from the main beaches and town of Haad Rin. Come relax and enjoy! Dreamland Resort is situated on Thong Nai Pan Yai Beach, the larger of two beaches found in the stunning surrounding of Thong Nai Pan Bay. The resort offers more than 50 bungalows to guests which range from cozy classic simple beach huts starting at 600 Thai Baht right up to spacious family-sized units with air-con at up to 2000 Thai Baht per night. Drop In Hotel & Resort offers accommodation in the heart of Haad Rin town, with easy access to both Haad Rin Nai and Haad Rin Nok beaches. All rooms come with Air-Con, private western bathroom and hot water. The hotel is only a 5 minute walk to the Full Moon Party beach at Haad Rin Nok. Haad Rin Nok is only one of three white sand beaches that lie on the west coast of the Haad Rin peninsula. Only a short walk across the peninsula you will find Haad Rin Nai which is far quieter than its counterpart, with no clubs, a few chilled beach bars and plenty of great places to eat. The long stretching beaches on the west coast enjoy spectacular sunsets. Fairyland Club Resort is located on Haad Rin Nok, It is one of the most beautiful and idyllic beaches on Koh Pha Ngan, it's broad shoreline gently curves to form a perfect cove flanked by smooth volcanic peninsulas with the sun rising right in the middle of the bay. The beach is over one kilometre in length and was one of the first visited by travellers escaping Koh Samui over 20 years ago. 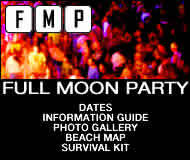 The Full Moon Party is on Had Rin Nok, and the southern half of the beach is mainly populated by nightclubs and restaurants whilst the northern end is mostly taken up by bungalow operation. 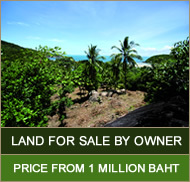 First Villa is located on a private beach at Baan Tai on the tropical island of Koh Phangan. It is a very tranquil place and the perfect spot you enjoy stunning sunsets over the Angthong Marine Park. The resort has rooms with either have sea and/or garden view. All rooms have air-con, hot water, minibar, TV and private safety deposit box. Grand Sea Resort is located on the idyllic white sand cove of Ao Nai Wok, just one kilometre from the town of Thongsala. It is far enough from the main port to ensure that your stay is as quiet and relaxing as possible, yet all the best amenities that the island has to offer are only a few minutes walk away. The resort occupies the entire upper end of the beach and has a variety of extremely well equipped Traditional Thai Lanna bungalows all including A/C, minibar and cable TV. The resort also boasts a beachfront swimming pool and stunning Thai restaurant. Haad Salad Villa is located on a secluded unspoiled bay with spectacular view of white sand beach and crystal clear water. Lined with palm trees and flanked by a virgin forest mountain range. This truly romantic location shall present you with your most memorable vacation. Kupu Kupu Phangan is a stylish retreat designed to take the island holiday experience to the next level. It celebrates the healthy attributes of the tropics with a collection of 20 villas, 2 suites and 1 apartment designed to unite Thai artistry with modern comforts and conveniences. The resort is a place to be at one with nature in a restful setting by the sea. The Lazy House Hostel is so much more than a hostel, with two great restaurants and an awesome bar they really have the full package! 4 to 26 bed air-con dorms and private rooms are available in the heart of Haad Rin town. Clean, friendly and convenient and free bucket every day, this is the place to stay for the Full Moon Party. Teep's Mai Pen Rai Bungalows - located in a tropical paradise at Than Sadet Beach on Kho Phangan Thailand. Here you can find a creative space to unwind and enjoy the peace and serenity of nature. Set on a white sandy beach, with blue clear water - this is an idyllic place to take a rest far from the crowds and realities of the rest of the world. Mai Pen Rai consists of 40 Bungalows. Each bungalow is special and unique with its original, artistic and spacious design, harmoniously blending with the nature around. My Way Bungalows is an established backpacker and family friendly Resort in Haad Salad. End of June 2008 it openend a very chilled bar right on the beach, where u can enjoy a nice sunset cocktail, dinner or even breakfast. Rin Beach has over 40 bungalows directly near the Haad Rin pier, most with sunset seaviews overlooking Koh Samui and the Southern coastline of Koh Phangan. There are a good variety of rooms available; all come standard with air-con, mini-bar, hot water and UBC TV. The Beach Village is a beachfront village style resort offering everything you need in one place to help make your stay as relaxing, stress-free and pleasurable as possible. Situated just 5 minutes from Thongsala pier and bustling Thongsala town, get straight down to business and cool down by taking a dip in our large tropical swimming pool or relax and sunbathe on the 200m of white sandy beach while sipping on a cocktail and enjoying the view of Koh Samui on the horizon and breathtaking sunsets. Surrounded by tropical greenery, The Blue Parrot is located along Koh Phangan’s Baan Tai Beach. The resort offers a Thai restaurant, a tour desk and free Wi-Fi in all rooms. The bungalow-style rooms are simply furnished and offer a choice of air conditioning or a fan. Each room has a private bathroom with a shower. The Coast Resort is convenient situated at Haad Rin Nai Beach, approximately 10 minutes walk to Full Moon Party or Haad Rin Beach. The hotel is fairly close to Haad Rin town where you can find all the shops, restaurants, bars and party scenes; yet distance enough to give you a peace of mind from staying away from the crowd. Haad Rin Nai Beach is a sunset beach so if you are a sun downer, come stay with us and get your first glimpse of the sunset sky with the cold drink in your hand. Wonderful resort in a secluded area amidst nature, located in the heart of islands, The Shore Resort is a place to refresh your body and fully relax during the stay. There are Hotel Room, Villa with private pool and Family villa for daily or long term rental. Villa Irisa is contemporary Thai design with modern open-plan living and wide outdoor spaces combining to provide an airy feeling that suits the climate perfectly. The main features must be the swimming pool and summer house complete with sun loungers, and we pride ourselves on being family friendly. Our villa is in close proximity to everything the island has to offer, there is the local walking street nearby (every Saturday evening) and plenty of beaches within easy distance.